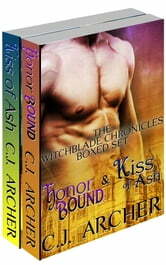 Historical paranormal romance like no other. Get both books in C.J. Archer's THE WITCHBLADE CHRONICLES in a single volume for one low price. After accidentally setting his house alight, Pippa leaves behind her ruthless uncle and travels to the home of Lord Ashbourne to search for her only friend. Disguised as a boy, Pippa accepts a job as page of the wardrobe to Ash, a man as mysterious as he is dangerous. Another two great books by C J Archer. Just love reading them all.